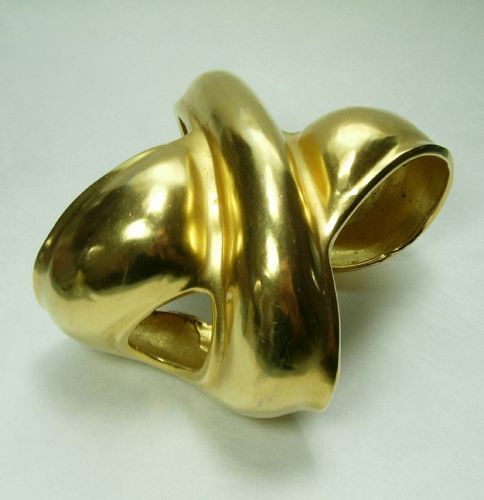 Fabulous big statement 1980s unsigned cuff bracelet in heavy cast matte finished goldtone metal by Robert Lee Morris, who designed jewelry for Donna Karan and many other top designers in the 1980s. Not marked but collectors will recognize Morris's distinctive style and construction. 3 inches wide and 7 to 7 1/4 inches inside circumference, including the gap, which is 1 inch. About 2 1/8 inches deep. Excellent condition with some very slight lightening of the goldtone finish on the back near the inside edges only, pictured but not noticeable or visible when worn. Price is adjusted to reflect this very small imperfection. Display form is life size. Photos enlarged to show detail.